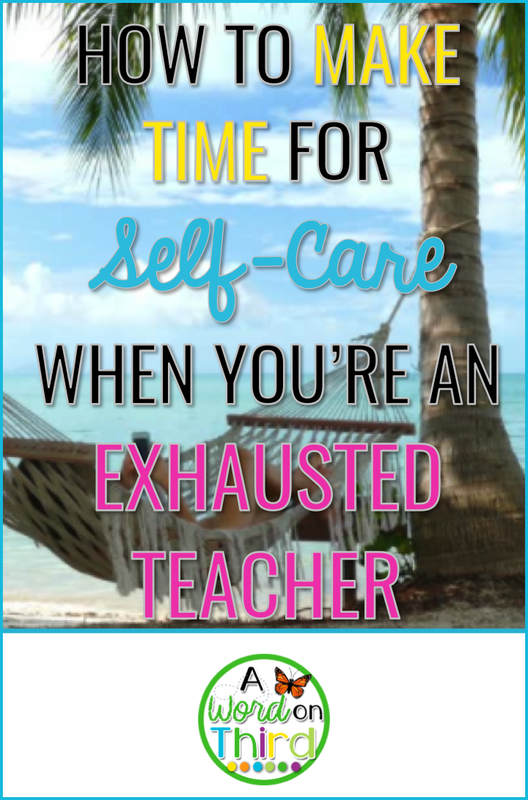 Have you ever noticed that every month or so, teachers will often say to each other, "It's that time of year again! I'm exhausted!" and nod in agreement? While I agree the demands on us are high--we can't just sit there and let ourselves reach exhaustion every few weeks. It's not sustainable. You can't pour from an empty cup. If you don't take care of yourself, nobody else will. Make yourself a priority. If you're busy and you feel like "you don't have time" for anything extra, then self-care is extra important for you in particular! These are my secrets to help you make time for yourself... and to fit it in without slacking on all of your other demands. Or... you know... going crazy! I practice this every day. If there's something I can do that will make me happier or healthier, I pair it with something else. I need to exercise, and I need to play with my dogs daily. That means that I go for a run and take my dogs with me. Now I've accomplished both at the same time. I like to read personal development books. I listen to a podcast or audiobook while I cook, clean, or drive to work. It makes my chores more enjoyable. I need to pack my lunches for the week. Can I make larger dinners and pack the leftovers for lunch when I'm cleaning up afterwards? This is all about working smarter, not harder. When you say, "I don't have time," it's a hint that you might not be using your time as efficiently as possible. There are endless resources to get better with this. It might not feel easy to accomplish all of the time, but scheduling breaks is scientifically proven to help you be more productive. This article shows how taking breaks will help you. After all, you give your kids brain breaks; you need them too! All you really need to do is set aside 3 to 5 minutes to reap the benefits. I recommend taking your break at the beginning of your prep and lunch periods. Even if you feel like you just have to finish something first, scheduling your break before doing anything else will help you be more productive later. It also ensures you fit your break in. How many times have you said to yourself that you would eat your lunch as soon as you finished making copies and grading those papers only to realize you didn't get to eat your lunch. You have to make this a priority, remember? How you take your breaks is up to you, but it's really important that you take them during the school day. You might decide to do a quick YouTube exercise or yoga video to get your blood pumping and wake your brain and body up. You might also do a quick breathing exercise or meditation. You can even just decide to walk around your school once or twice. Maybe you can even walk outside if the weather is nice! Once in a while, I open up a book that I am reading strictly for pleasure during lunch. Even if I only read it for 5 minutes, it's really nice!! 3. Make an effort to include one sweet thing in each day. Bring a pair of slippers to work for after your students leave. Play your favorite songs over your projector speakers once the kids leave. Play a nature video in the background during your lunch and prep periods. Make your favorite cup of tea. Put your favorite scent in your essential oil diffuser. Put your phone down and pay attention while you snuggle your dog. Tidy up a space you spend time in often until you're happy with it. Sing to your favorite upbeat song on your drive home. Make a list that makes you happy and stick with it! I'm sure some of the stuff on my list would be annoying to you, so don't pick anything that would bother you. 4. Practice the 80-20 rule. Scientists say that our most important tasks, which tend to take up 20 percent of our time, tend to yield 80% of our results. That means we need to spend some time thinking about our priorities. What does that mean for an exhausted teacher? It means you don't have to make that font pretty. You don't have to put that copy on the prettiest colored paper when you can't find it. You don't have to use your prettiest hand lettering on your anchor charts. Those kinds of things aren't going to lead to the most significant learning outcomes. If you're exhausted, you need to ask yourself what you value most. Maybe you can come back to those other nice things when you aren't exhausted again. Give yourself permission to be human and to prioritize well for you. Let some things go. 5. Implement basic healthy habits one at a time. Being mentally, emotionally, and physically healthy is really important, but it's not easy to get started all of the time. How many of us have set New Year's Resolutions and given up on them a few weeks or months later? It's because we're busy and we've bitten off more than we can chew. Let's say I decide to get more sleep. Some people say they will get 8 hours of sleep per night, but they fail at it over and over again. That's because you're really not changing one habit at a time; you're changing many! You have to get to bed earlier, do different before-bed rituals (like washing your face or packing your lunch) earlier, stop binging on Netflix when you are supposed to be going to bed, put your kids to bed earlier, etc. That's a lot of different habits just to get more sleep! The take away here is that you need to do those things one at a time if you want the habit to stick. If you want to drink more water each day, that is simple enough that you probably can just buy a bigger water bottle and plan to drink 2 of them during your work day. However, you can't plan to drink more water, eat healthier, meal prep, and exercise all at once if you haven't gradually implemented those habits into your life. Therefore, that means you should focus on implementing one of these tips first rather than trying all give at once. These tips have really helped me to practice self-care. Double-dipping helps me in particular. I regularly make extra servings of a weekend lunch so I have lunches for the week. What's the tip that you are going to try? Comment below and let me know how you're going to implement it! By the way, if you haven't already subscribed, we'd love to have you! Join our community by signing up in the box right under my bio to the right.